Search Results for "gold rush"
BODIE, CA - Circa September, 2018 - Tourists visit the old west gold rush town of Bodie, California on a sunny summer day. A summer daytime exterior establishing shot of the old west gold rush town of Bodie, California on a sunny summer day. 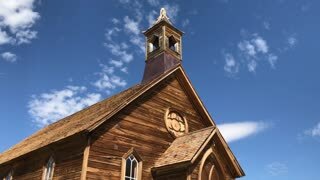 A daytime summer establishing shot of the Bodie Methodist Church in the old gold rush town of Bodie, California. Colorado ghost town with river flowing. Taiya River in ALASKA is part of the Chilkoot hike trail once a centerpiece of gold rush history in Skagway. 1962 - In 1867 the United States bought Alaska from Russia, and a few decades later was the Alaskan Gold Rush. River and stream is part of the Chilkoot hike trail, once a centerpiece of gold rush history in Skagway. A historic bridge by the Taiya River in ALASKA, is part of the Chilkoot hike trail, once a centerpiece of gold rush history in Skagway. hike trail, once a centerpiece of gold rush history in Skagway.